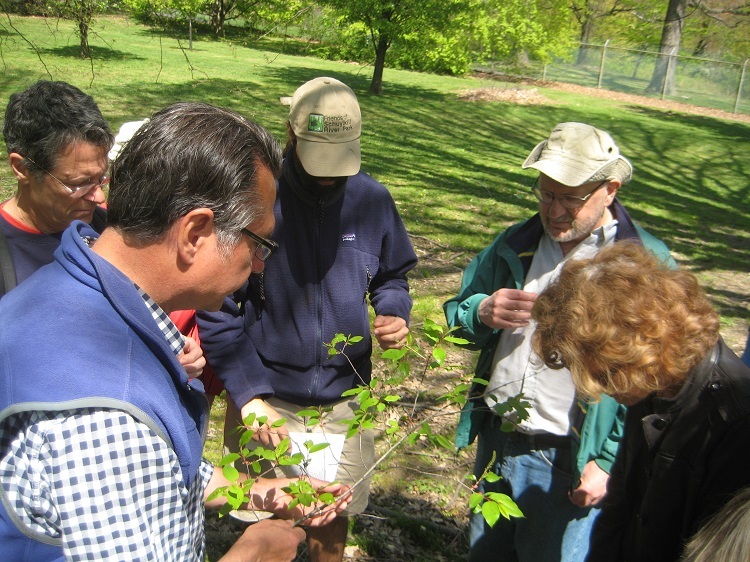 The Parks Alliance’s ParkTours program features hikes and walks to magical and often unseen places in Philadelphia’s parks and surrounding countryside. These evening, half-day and full-day adventures convey the history, power and value of our open space and the need to preserve and protect it. Parks Alliance founder and Board President Bob Thomas and local arborist Ken LeRoy have been designing and leading intriguing ParkTours for many years. Let us know if you would like to lead a park tour or if you are interested in having a tour visit your park. Become a member today for discounted member pricing on ParkTours! The Half Day Tour: A train ride from 30th Street Station to Overbrook, and then a 3 mile walk through historic Overbrook and along the Indian Creek and the Valley Forge to Heinz Refuge Trails. Return to either 30th Street Sta. or Overbrook Station via SEPTA. Moderate difficulty. Bring: binoculars and camera to observe views, wildlife and points of interest. Picnic food, snacks and beverages for the walk. Also, warm clothes and good walking shoes or hiking boots as the weather may require. The route is mostly on a mix of park trails and some sidewalks. Meeting Place: Meet at 10:00am for brunch at 30th Street Station, sitting with us at the tables in the Food Court along Market Street after you get your food. We will depart at 10:47am on the SEPTA Malvern train #513, arriving at Overbrook at 10:55am. You may also meet us at 10.55am at the Overbrook Rail Station at 2195 N. 63rd St., off City Avenue, where there is free parking on the weekend. •Easy: Good surface, short length, can be enjoyed by almost anyone in good health with good walking shoes. •Moderate Difficulty: May contain some rough or wet surfaces, some steep paths. Length greater than a “short walk or ride”. Can be enjoyed by almost anyone who walks or exercises regularly, and with sturdy shoes, unless otherwise noted. •Challenging: May contain rough surfaces, overgrown areas, and steep terrain. Length may require walking more than 10 miles or most of the day. Can be enjoyed by almost anyone whose stamina allows a full day of exercise, and with hiking boots unless otherwise noted. Rain: If raining or threatening heavy rain, tours will be rescheduled unless otherwise noted. Watch for future listings. Fees for evening and half-day tours (unless otherwise noted): $15 for members of the Philadelphia Parks Alliance , Sierra Club, Pa. Environmental Council, Green Space Alliance, American Institute of Architects, American Society of Landscape Architects, Appalachian Trail Conservancy, Appalachian Mountain Club, Hosteling International, Preservation Alliance for Greater Philadelphia, East Coast Greenway, University City Historical Society, Women’s Transportation Seminar, the Tookany-Tacony-Frankford Watershed Partnership, or the Schuylkill River Greenway Association. $20 for non-members. All-day tours are $30 for members/$40 for non-members. Contact the office re: fees for multi-day and special tours. Continuing Education Credits: AIA members are eligible for CE Credits for some of these tours. One happy hour ticket includes your first drink from the bar, good for a house red wine, a house white wine, a well cocktail, or a select beer! Light snacks will be provided. All starting points are planned to be accessible by public transit. Directions will be furnished upon registration. If raining or threatening, tours will be cancelled and rescheduled unless otherwise noted. Watch for future listings. Due to the increasing popularity of our tours, we ask that you prepay to reserve your space. In order to preserve the quality of the tour, all full-day tours have a firm limit of participants. Additional registrants will be placed on a waiting list. If you are unable to attend, please let us know at least 48 hours prior to the tour and we will issue a refund or tour credit and offer your space to the next person on the waiting list. No refunds or credits will be issued less than 48 hours before the tour. For additional information, please contact the Philadelphia Parks Alliance: 215-879-8159, friends@philaparks.org. American Institute of Architects; American Society of Landscape Architects; Appalachian Trail Conservancy; Bicycle Coalition of Greater Philadelphia; East Coast Greenway; Green Space Alliance; Hostelling International; Pennsylvania Environmental Council; Philadelphia Parks Alliance; Preservation Alliance for Greater Philadelphia; REI; Schuylkill River Greenway Association; Sierra Club; University City Historical Society; Women's Transportation Seminar.